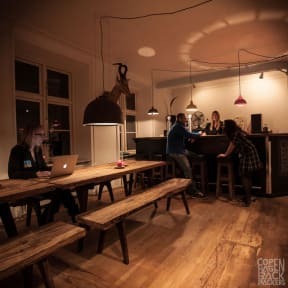 Copenhagen Backpackers kohteessa Kööpenhamina, Tanska: Varaa nyt! A great hostel! The beds were soft and had proper pillows and duvets and the bathrooms were nice and clean. The common room was very cozy and nicely decorated and the staff were helpful. Every bed had a curtain so you got your privacy even though many people slept in the same room. I really can't find a downside, a superb hostel! I definitely recommend it! Very close to central station. Supermarket, restaurant and pubs just round the corner. Small hostel, friendly staff. Mattress a bit uncomfortable. The location is really good, just off the main train station and plenty of shops nearby. It's on the 2nd floor and no lift btw. The staff was friendly, accommodating and helpful. Downside was that my room was next to the reception and I woke up several times at night to the sounds of people coming and going, doorbell ringing etc. Only realised the next morning that they offer free earplugs :( Toilet didn't have hand soap and the shower room looked so rough I just skipped having a shower.